Negotiating is an art form. It can be a complex process but one well worth mastering. If you can master it, you can save yourself a lot of money. How you negotiate will determine the failure or success of the negotiation. When negotiating never suggest that someone's services are not worth what they are asking. Rather than saying, "It's not worth it", say something like, "I really can't afford more that much for this service right now. Give the person you are negotiating with a cash incentive by offering to pay in cash if they would agree to lower the price. Before you begin to negotiate, decide your bottom line and what you are willing to pay. The best negotiations happen when you deal with the actual contractor rather than the contractor's employee. Give the person you are negotiating with a reason to drop their price. For example, if you are having your house painted, ask the painter if he will drop his price if you purchase the supplies. Before entering a negotiations, make sure you are absolutely clear on what outcome you want to achieve. Plan your questions, strategies, alternative offers and suggestions based on how the other party may respond. Sales experts suggest that sales people rarely cave in on the first round, so don't give in to the first "no" or to the first offer. Remember, negotiation is a game. It's the "art of the deal." To win the deal you must be willing to play. This is single most important strategy to getting what you want out of life. If you aren't prepared to say, "No" and mean it; then you are likely to end up settling for a lesser outcome. Before entering into any negotiation, know in advance exactly what you are and are not willing to concede. Don't get into an argument when negotiating. This will only create a negative dialogue between you and the person you're trying to negotiate with. Arguing, deaming the other person and getting into a power struggle with not help you to win a negotiation. Negotiations should be a win-win for both people involved in the negotiation. This helps the people involved to keep good working relationships afterwards. Only consider win-lose negotiation if you don't need to have an ongoing relationship with the other party. If the other party feels as if they "lost", they will be less likely to want to work, or negotiate, with you again. Many Hospitals can, and will, negotiate medical charges. They would rather get paid by you than have to turn the bill over to a collection agency or write the charges off. Start the negotiation by explaining your financial situation. Next, offer a lowball sum, maybe 30%...but don't expect to pay less than 50%. They will often knock off 25% of the bill. If they want you to pay more than 75% then try asking for the person's supervisor. Bartering is the exchange of goods or services, and is usually used as a form of payment or in exchange for product or services. Basically, bartering is the trading of a product or service for another. 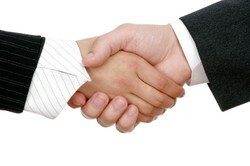 If you perform a service, such as website design or legal services, then negotiate your services as a form of payment. Negotiate what you have to offer for what you want. These are some great tips - I still have a lot to learn about negotiation. In theory, I can work it out, but actually practicing it is another ball game. I often have trouble sticking to my bottom line.